John Flexman knew he wanted to be a pilot from moment he saw an RAF flypast as a boy of eight. At sixteen he joined the Fleet Air Arm of the Royal Navy, getting his ‘wings’ in 1961 at the age of 18. From there on he never looked back. His flying career took him around the world, from the Far East to Africa and back again. John came within seconds of disaster on several occasions and often encountered tragedy, losing several friends and colleagues in flying accidents. During his years as a private pilot in Africa he flew the dictator Idi Amin several times, while on the ground he was able to witness the barbaric results of the dictator’s régime. He went on to fly an assortment of prominent businessmen, politicians and pop stars, from Norman Tebbitt to Phil Collins and Paul McCartney. John finally retired at 60, having survived a 42-year career spanning 17,800 flying hours. 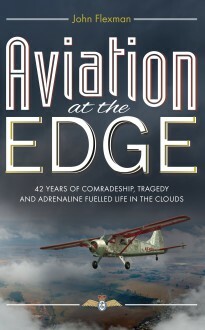 Aviation At The Edge is his story.